Artist Krocette (David Prior) with one of his artworks. 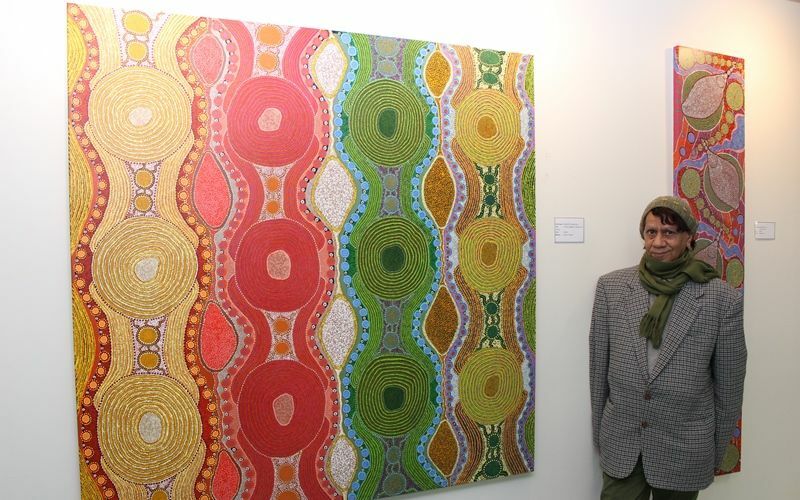 OSBORNE Park Hospital will host an Indigenous art exhibition by artist Krocette for Naidoc week. Krocette (David Prior) who has been painting since he was 10 years old is a self-taught painter and tells stories of the Gascoyne area where his mother and grandmother grew up. Staff at Osborne Park Hospital (OPH) paid respects to Naidoc Week on June 30, with a traditional smoking and cleansing ceremony and morning tea. OPH corporate and patient support services manager Maria Weston said the hospital’s Reconciliation Action Plan committee had started a new initiative where Aboriginal Hospital Liaison Officers (AHLOs) visited patients with Aboriginal and Torres Strait Islander backgrounds. She said the AHLOs acted as a link between hospital staff, patients, family and community health services. “Together with the AHLOs we are working to provide the best care for all patients recognising their cultural needs and health requirements,” she said. Ms Weston said Krocette’s art was available for sale and members of the community were invited to view the artworks at the hospital for the whole of July.